Preheat oven to 350 degrees F (180 degrees C). Grease 2 7-inch cake pans and set aside. In a large mixing bowl, cream together the butter and sugar until light and fluffy. Add the eggs one at a time, beating well after each addition. Beat in the vegetable oil and vanilla extract. Gradually add in the cake flour, baking powder, baking soda, and salt. Mix in the milk, stirring until batter is uniform and smooth. Divide batter evenly between prepared pans and bake for 35-40 minutes, or until a toothpick inserted into the center comes out clean. Remove from the oven and allow to cool for at least 10 minutes before removing the cake and transferring the cake to a cooling rack to cool completely. In a blender or food processor, process strawberries until smooth. In a large bowl, beat the egg white until foamy. Gradually add the sugar and salt and continue beating for 5/7 minutes, or until soft peaks form. Add the strawberries and continue beating until stiff peaks form, about 3-5 minutes. Refrigerate the mousse until ready to assemble cake. There will be leftovers. If you freeze the mousse, it turns into a light ice cream and is lovely to enjoy by the spoonful. In a large bowl, whip together all ingredients until stiff peaks form. Chill the whipped cream until ready to assemble. On a serving plate, place the bottom layer of the cake. Cut a handful of strawberries into quarters and place them randomly over the surface. Spoon on the chilled strawberry mousse and place the cake in the freezer for 15-20 minutes (or longer) to stiffen the filling. Place on the top layer of cake. Using an offset spatula, frost the cake on all sides with the whipped cream icing. 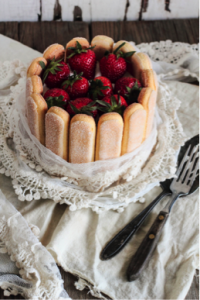 Press the ladyfingers along the outside of the cake, spacing them evenly. Dot the top of the surface with the remaining fresh strawberries. Refrigerate until ready to serve.